Now offering FREE BASIC SHIPPING on all orders in the USA! Expedited and international delivery are still available, don't worry! These lightweight plugs are a must-have for anyone with stretched ears and a knack for style. They are simple enough for daytime, but also look great dressed up going out at night. 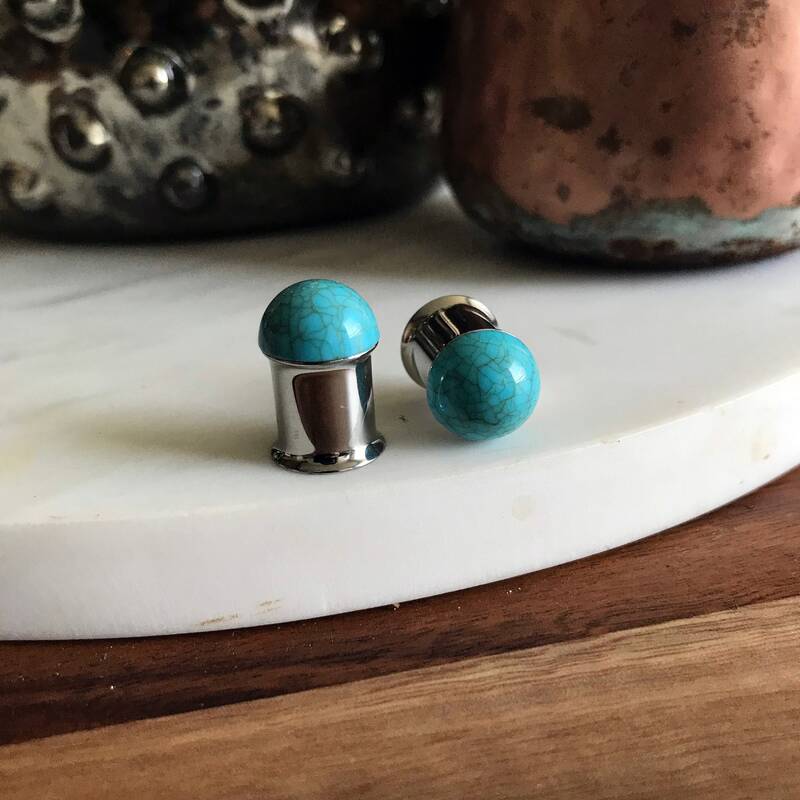 These plugs are handmade with faux turquoise cabochons surgical steel tunnels with silicone o-rings. Message me if you'd like options for larger sizes. Handle with care, especially during travel- they are strong but not unbreakable! Almost all of my products are made to order; I will begin working on your product shortly after the payment is cleared. I accept PayPal, debit or credit cards (Visa, Mastercard, AMEX, Discover), and Etsy gift cards. 8.25% tax rate for Texas customers applies. All items will ship from Savannah, Texas via USPS First Class Mail with tracking unless you purchase Priority or Priority Express shipping options. You can find a link with your tracking number on your invoice. I cannot refund or replace packages marked as "Delivered" by USPS, for obvious reasons. Please double-check that you enter the correct shipping address. Production time is about a week for most of my products, but check in your product description for more information. I will ship your product(s) as soon as possible! If you need a rush on a product, please contact me before placing the order. All products will be packed in a jewelry box inside a padded envelope. Message me if you would like me to add a custom note to the package. Domestic shipping normally takes less than a week from my post office to your door, but is sometimes longer based on heavy volume at the post office or inclement weather. Please note that the estimated shipping time is not including the time it takes me to make an order, which can be up to 5 days based on volume of orders. If you have concerns, please message me before placing your order. International shipment time varies based on distance and customs processing time. The buyer will be responsible for any customs duties or VAT (Value Added Tax). These fees vary and are unpredictable. Please know your country's policies before ordering. In the circumstance that a package is returned to me stating that it was never claimed, the buyer will be responsible for charges to re-ship the package. If the buyer chooses to receive a refund instead, the initial shipping cost will not be refunded. 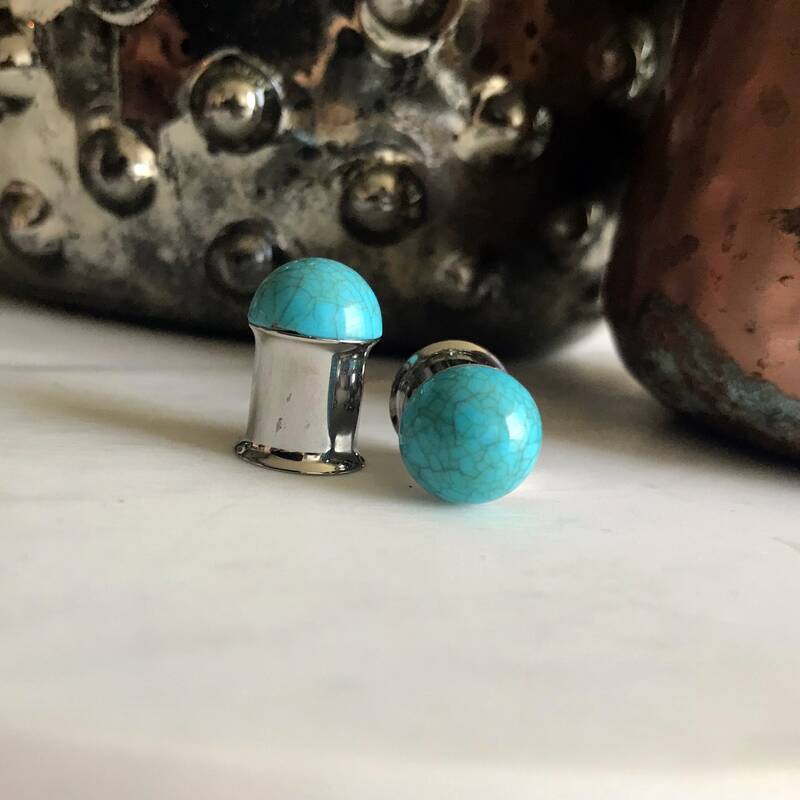 Body jewelry (plugs), custom orders and sale items cannot be returned or exchanged, please make sure to order the correct size. Message me if you need help with figuring out the right size! All other jewelry (rings, bracelets, necklaces, etc) can be returned or exchanged within 30 days of shipment. See below for more details. Please contact me if you are unhappy with your product before leaving feedback! I am more than happy to discuss any problems that arise. 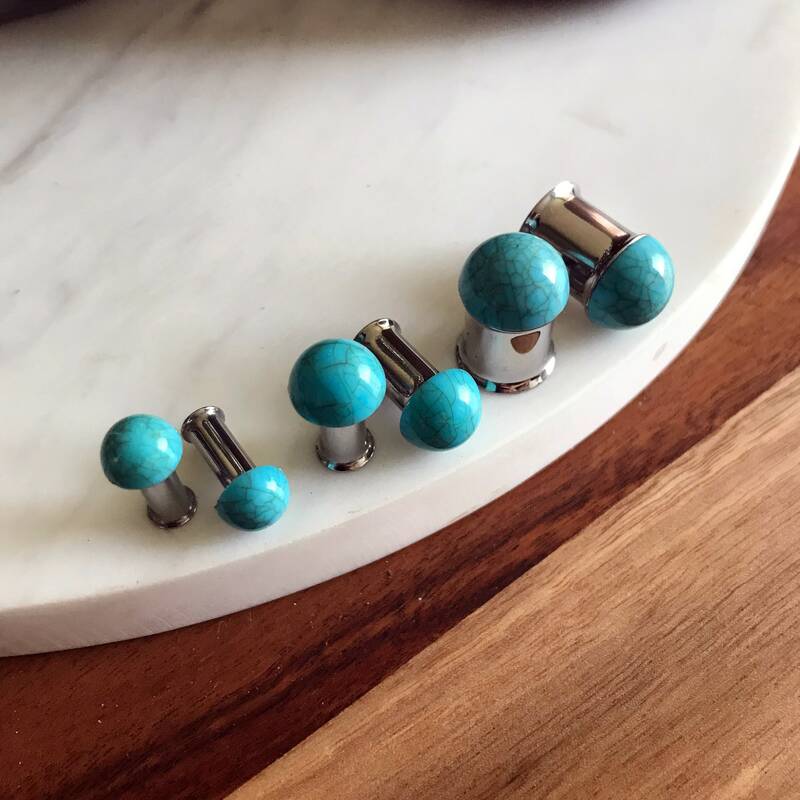 As stated before, I cannot take returns or exchanges on body jewelry (plugs). My terms for exchange/refund last 30 days after I ship your package. To be eligible for an exchange, your item must be unused and in the same condition that you received it. It must also be in the original packaging. I will email you shortly after receiving the original item to find out which item(s) you wish to replace your original purchase with. After 30 days, I unfortunately cannot accept returns or exchanges. For obvious reasons, I cannot accept returns on body jewelry (plugs). All other refunds can be accepted if the item was received damaged. Under other circumstances, email me for return approval before sending the package back. Once your return is received, I will send you an email to notify you that I have received your returned item. If you are approved for refund, a credit will be applied to your credit card promptly. Then contact your credit card company, it may take a few days before your refund is officially posted. Next contact your bank to see if any transactions are hidden or pending. If you've done all of this and you still have not received your refund yet, please contact me via Etsy conversation. To return your product, message me for the address and information. You will be responsible for paying for your own shipping costs for returning your item. Shipping costs are non-refundable. As stated above- if you receive a refund, the cost of return shipping will be deducted from your refund. I recommend adding tracking onto your return shipping as I cannot refund or replace any untracked returns that are lost in the mail. 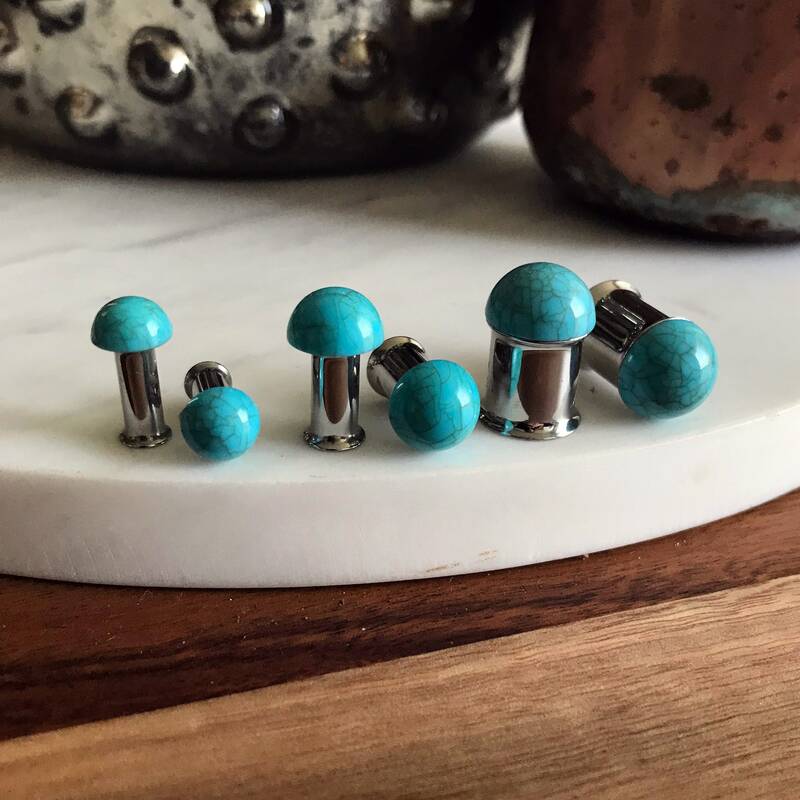 Most of my plugs are made with surgical-grade stainless steel, organic wood, or polished stone. These can be wiped with a dry cloth or alcohol pad to clean. I do not recommend wearing most of my jewelry in pools, the ocean, the shower, etc. as it can damage some of the details. Contact me if you'd prefer single-flared tunnels instead of double-flared tunnels if the option is not already available on a certain listing. I will gladly make you a custom pair. I can wholesale a selection of my designs to retailers. Message me for more information. 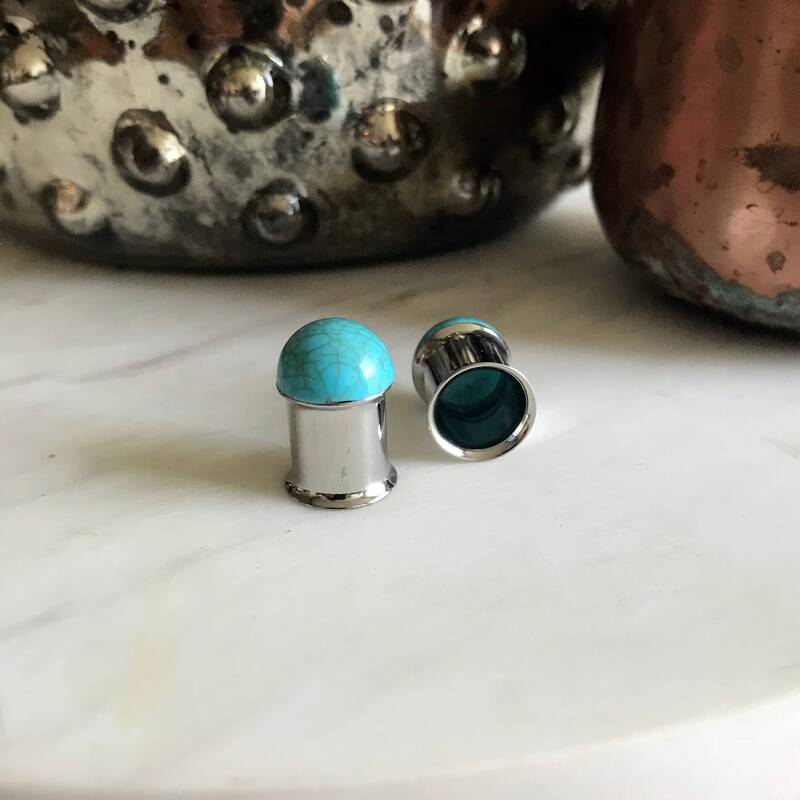 Do you offer single-flare or screw-back tunnels for the plugs? I do have single-flared tunnels with silicone O-rings available in most pairs of plugs, but I do not carry any screw-back plugs. You can always message me for a custom order, though. I do not see the size that I need for a certain pair of plugs, can I still order them? Most of my plugs are only available exactly as pictured in a certain range of sizes, however I can almost always create similar styles for other sizes. Please message me for custom order and additional size requests before ordering. Store away from heat and moisture. I don't recommend wearing any of my jewelry in water as it may tarnish certain pieces. To clean plugs, wipe down the bases with damp alcohol pads or dry tissues. For plugs, please message me if you have questions about sizing before ordering. I cannot accept returns on body jewelry for obvious reasons. My plugs run very true to their millimeter sizing. 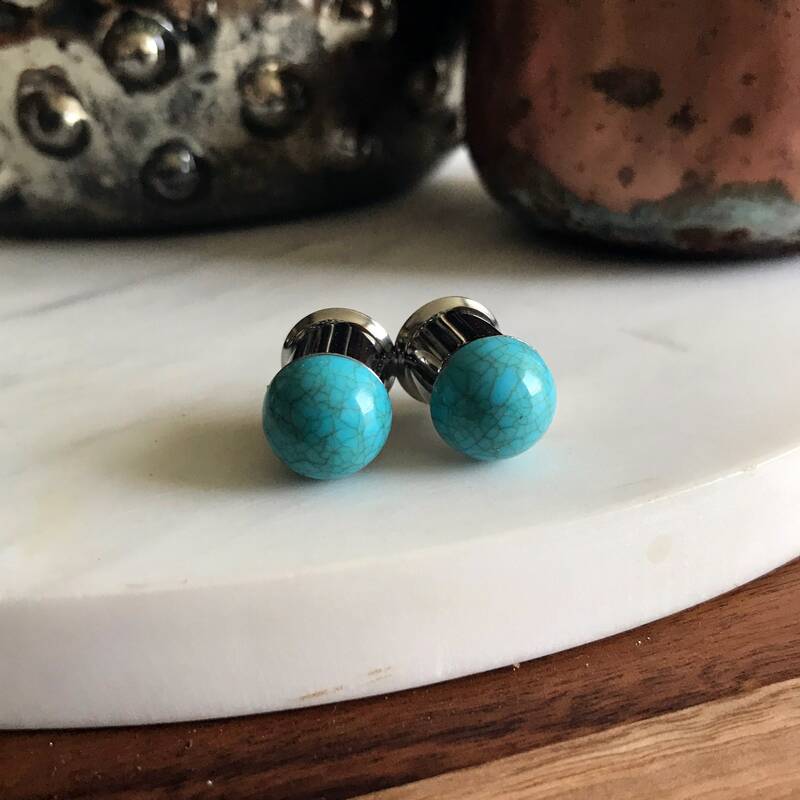 I can usually make a size estimate through pictures; if you are unsure of your size just send me a message with a picture of a pair of your plugs that fit well and I can help determine the right size. I provide silicone o-rings to counter-balance any added weight on the front of the plugs. Please let me know if you have an allergy to silicone and I will instead provide acrylic o-rings with your pair. Are the plugs sold individually or as a pair? They are priced as a pair! So a quantity of "1" will be for a pair of plugs (2 individual plugs). I can, however, make you a custom listing if you would prefer a single plug instead of a pair! Contact me for more info. 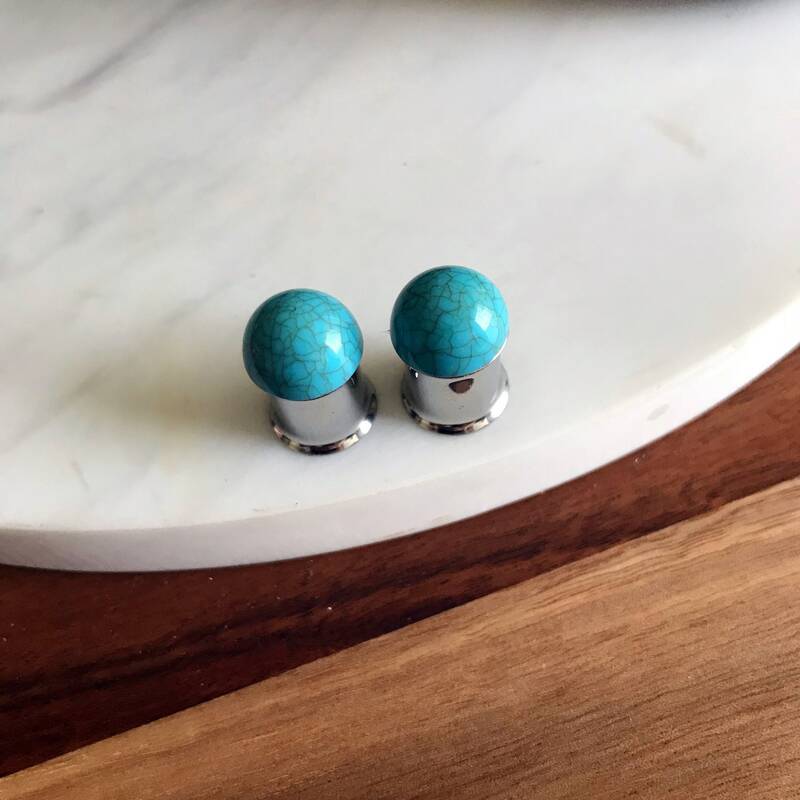 The beautiful blue stone makes these gauges so wearable- even in an office setting!